Over the past three decades, the global auto industry has gotten, well, more global. Manufacturers built scores of factories outside their home countries to reduce exposure to currency swings, take advantage of cheaper labour and manufacture cars closer to buyers. BMW AG makes crossovers in South Carolina. Toyota Motor Corp. produces sedans in Kentucky. General Motors manufactures pickups in Mexico. Hyundai Motor Co. builds crossovers in the Czech Republic. And almost everyone is producing more of almost everything in China. While cars are typically sold in the countries where they’re made, it’s not uncommon for them to also be shipped abroad. BMW, for instance, is America’s top auto exporter, sending some US$10 billion worth of vehicles including the X5 crossover to other nations last year. This system is under threat as President Donald Trump embarks on trade wars he’s described as easy to win. Cars are significant contributors to deficits he’s repeatedly said are “very unfair” to the U.S., with Germany coming under particularly heavy criticism. 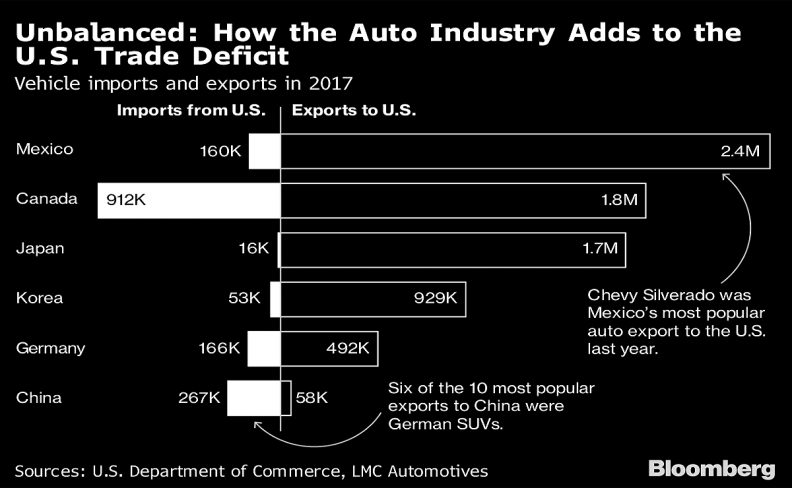 But after months of tough talk and threats, the first country whose autos Trump is targeting with tariffs is one the U.S. actually has a surplus with: China. The risk for the global auto industry is that this may be merely an opening salvo in a battle by the Trump administration against cars shipped to American shores. The Commerce Department is looking into whether vehicle imports pose a national security threat, and tariffs of as much as 25 per cent are said to be under consideration. Last year, two of the top-selling models imported from the country were GM’s Chevrolet Silverado and heavy-duty versions of Fiat Chrysler Automobiles' Ram pickups. While Trump has touted Fiat Chrysler’s plans to shift production from Mexico, that’s not happening until 2020. GM is about to add to the flow of Mexican imports by bringing back the Blazer and building the crossover it at the company’s plant in Ramos Arizpe. Japan’s Toyota and Honda Motor Co. would be hit hardest if the U.S. decides to tax autos built by its neighbour to the north. But GM and FCA wouldn’t be spared harm. For decades, Japan’s imports of fuel-efficient small cars chipped away at the Detroit Three’s market share. Nowadays, the country’s automakers are sending over hundreds of thousands of hot-selling compact crossovers. For more data and charts from Bloomberg, click here.